Energy Control Systems, Inc. has been serving the natural gas industry with a wide variety of fabricated piping products since 1973. Under the watchful eye of the Royston family since its inception, ECSI has expanded its product line to include a vast assortment of commonly used meter bracketing systems, pipeline markers, test stations and cathodic protection anodes, in addition to a host of specialty items produced to exacting customer specifications. of these services places ECSI in a unique niche among gas industry suppliers. We listen to our customers and develop customized products to fit their needs. Our years of manufacturing for the gas industry and our experience with metal stamping, forming and fabrication enable us to provide quality products that exceed our customers’ expectations. We specialize in manufacturing meter brackets and supports including adjustable, or fixed, sidings and driven post supports. 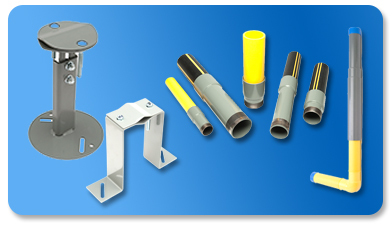 We offer a wide range of threaded and welded end transition fittings in MDPE and HDPE materials to accommodate most gas line connections. Our underground pipeline markers offer high visibility and are made from high density polyethylene to offer long term durability. Our risers are pressure tested and meet DOT requirements and are available in sizes from 1/2" CTS through 4" IPS sizes in pre-bent, preformed, flexible or hybrid styles. Available in seven sizes and styles from 1/2 lb. to 3 lbs., Our "Husky" Drive-in Magnesium Anode Rods provide easy, reliable, cathodic protect of natural gas service lines. Easily find your nearest ECSI representative or distributor online for personal service with your specific application needs. For more information on ECSI's products and services click here to contact us online.